Given the waves of anti-government protests which have recently engulfed Haiti, one would have thought that Haitian President Michel Martelly would have found refuge from controversy while visiting the United Nations General Assembly in New York. Yet this was not the case. Given the waves of anti-government protests which have recently engulfed Haiti, one would have thought that Haitian President Michel Martelly would have found refuge from controversy while visiting the United Nations General Assembly in New York. Yet this was not the case. While the past several weeks have seen protests spread throughout Haiti, from Port au Prince to Cap Haitien, Gonaives and La Cayes, they have even followed Martelly to Brooklyn, New York. The purpose of the new tax—which was implemented in June 2011 but not presented to the Haitian parliament for ratification—was to raise funds for an accessible national education program which would waive all of the registration fees for primary students. At the time it was hailed as an innovative way for cash strapped Haiti to raise funds for much needed public services and by September 2011 it was announced that the fund had raised roughly $28 million. However, the promise of the program was short lived, as Martelly came under fire from Digicel Director Dennis O’Brien, who requested an audit of the National Education Fund in January after hearing that Governor of the National Bank of Haiti, Charles Castel, announced that only $2 million remained in the fund. The man responsible for administering the failed National Education Fund was then Foreign Minister, and current Prime Minister, Laurent Lamothe. In an effort which would only prove his critics right and fuel more allegations about the mismanagement of funds, Martelly flew to the General Assembly in New York with an enormous entourage consisting of 78 people. Back in Haiti, there is no single identifiable cause of the widespread protests. A variety of groups are taking to the street to voice their frustration with the previously mentioned ineffectiveness and corruption of the Martelly administration and as well as to voice outrage stemming from an emerging judicial crisis and rising food prices. The judicial crisis began on September 27 when former Chief Prosecutor for Port-au-Prince, Jean Renel Senatus, stated that Haiti's Justice Minister Jean Renel Sanon fired him for his refusal to execute an order to arrest 36 government opponents. Among the government opponents were Newton St. Juste and Andre Michel, who have respectively brought up corruption complaints aimed at the President, his family, and members of his administration. Human rights attorney Mario Joseph was also amongst those targeted for illegal arrest and detention. In response to this, the Inter­na­tional Asso­ci­a­tion of People’s Lawyers (IAPL), an inter­na­tional alliance of pro­gres­sive human rights lawyers, jurists, law stu­dents and legal work­ers, issued a statement which denounced the move and expressed deep concern for the safety of Joseph—known for his tireless representation of political dissidents and the poor. La Cayes and Cap Haitien have both been the site of popularly supported strikes in September and again this week. In Gonaives, protests erupted due to the poor conditions of the local university on September 24. 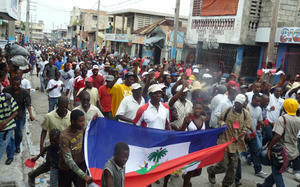 On October 1, thousands of supporters of former President Jean Bertrand Aristide marched through Port au Prince. For more information and analysis on these and many more protests please read this article by Dady Chery. In regards to the rising food prices, AlterPresse reported that “Since August the price of a 25-kilogram sack of rice has risen from 900 to 1,150 gourdes ($21.35 to $27.28), the residents said; a sack of flour went from 1,100 to 1,300 gourdes ($26.10 to $30.84); and a gallon of cooking oil rose from 300 to 450 gourdes ($7.12 to $8.07).” Rising food prices toppled the Haitian Prime Minister Jacques Edouard Alexis in 2008, and unless meaningful steps are taken to secure the local food supply and lower prices, given all the additional controversies, it is not an unrealistic prediction that something similar could happen again. Former Presidential candidate and head of the Assembly of Progressive National Democrats (RNDP by its French acronym), Mirlande Manigat, highlighted the importance of the protests, stating that “These developments show that now the people are no longer just talking; they are acting.” As such, it is a very real possibility that the Haiti that President Martelly returned to on Sunday is different from the one he left. Perhaps he will take the protests as a wake up call. It remains to be seen if Martelly will actually seek to address the issues or suppress them along with the protestors. But from all appearances, whether Martelly chooses to solve the problems the people are demanding or not, the people are wide awake.